The first Lutherans to setup a church in Butler were mostly German immigrants who worshiped at St. Mark’s Lutheran Church with worship services in their native tongue. Younger and American-born members of St. Mark’s who wanted services conducted in English, met and formed the First English Lutheran Church on .January 16, 1843. Twenty-two men and twenty-three women formally adopted a constitution to gu ide the new church and called Reverent Gottlieb Bassler as the first pastor with a salary of $50 per year with services in English conducted at the county courthouse and in the Saint Mark sanctuary. First English following a fire on January 11th, 2019 that destroyed the social room and offices. Butler had its first house of worship — a small brick building on the corner of Church and North Streets, a building that served the congregation for the next twenty-seven years. The Witherspoon Institute Building, site of the present church on the corner of Main and Brady streets (see insert image below), was purchased in 1874 for $6000 and remodeled in 1877 for $1700. When the Butler County Courthouse was destroyed in December 1883, the county rented this building as a temporary court. 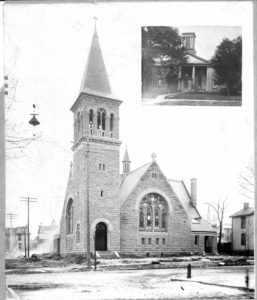 In 1898, a cornerstone for a new stone church was laid on the Main Street site, but in 1919, the building was destroyed by fire. From those ashes a beautiful new stone building, First English Lutheran’s present home, was built and dedicated on September 12, 1920. In 1960 First English Lutheran built Luther Hall, a building immediately to the east to the church on McKean Street for Sunday School classes and a social and recreational center. Luther Hall was sold to the Butler Public Library in 1984 and is now the north half of the new recently remodeled Butler Public Library. After sale of the hall, the church proper was renovated to better suit the needs of the congregation. The history of the church includes stories of colorful local characters such as Sam Mohawk who was baptized through First English Church. The unique architecture of First English with its large wood beam ceiling and spacious sanctuary make it a popular location for weddings. Twenty-one dedicated pastors and one assistant pastor have served the congregation faithfully and well since its founding in 1843. Nine sons of the congregation have entered the ministry of the Lutheran Church. 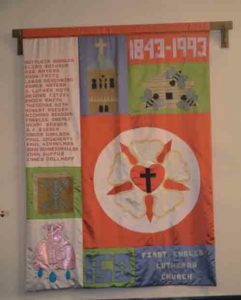 First English Lutheran Church can be justly proud of its history.